Concrete pavers are a type of easy-to-install concrete driveway that is designed to take the stress and pressure of cars and vehicles driving over the surface. Pavers are an excellent alternative to more traditional driveways because they offer greater aesthetic interest, are much easier to install and according to Grounds Maintenance Magazine, are a cost-effective alternative to other paving methods. Plan the area that you want to use as a driveway. Measure a space about 6 feet wider than the width of your car. In a smaller yard, a 4 foot addition will also work. Spray paint the outline of the driveway. It is easiest to install the pavers in a straight line. If possible, make the driveway as wide as the measurements of 8 to 12 pavers, so you do not have to cut any of them. 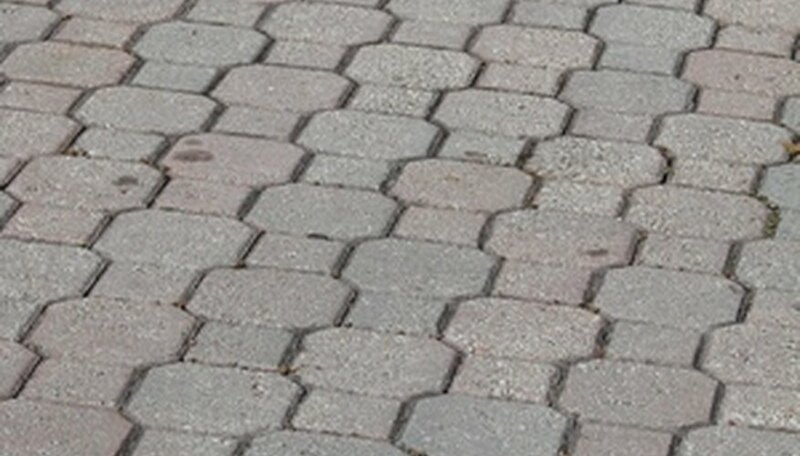 Estimate how many pavers are necessary by calculating the square feet of the driveway. Use the measurement of the house doorway or base of the steps leading up to the house as a basis for the top of the driveway. You want the driveway to sit just under the doorway or level with the bottom of the steps. Check the slope. Every 5 feet the pavers need to drop 1 inch in height to allow for drainage. If you have a 10-foot long driveway, then the bottom of the driveway should be at least 2 inches lower than the top. Place stakes every 3 to 5 feet along the driveway outline. Tie a 2 by 4 board to the stake sitting next to the top of the driveway. Make sure it is level, and tie it to the next stake in a level position. Make a mark for the intended height of the driveway with a pencil. In addition to the height of the pavers, you also need about 6 extra inches for base materials. Dig out the site with a shovel. Use the tamp to keep the ground hard and structured as you work. Measure the ground after soil excavation to ensure that the bottom of the driveway is at least 2 inches lower than the top. Pour 4inches of crushed rock into the hole. Use the tamp to tightly compact the stone. Moisten the rocks slightly with a garden hose before tamping to increase settling power. Line the edges of the driveway with metal edge restraints. These are designed to prevent the driveway from moving under pressure from the car and natural weathering. Most construction supply stores sell edge restraints for paving. Hold the restraints in place with metal spikes. Line the base of the driveway with 1inch of construction sand. Moisten the sand slightly with a hose and tamp it tightly into place. Lay the pavers in the desired patterns. Many driveway pavers are interlocking, making them easy to work with. Make sure the pavers line up properly and fill the entire driveway bed. Fill any remaining cracks with sand. Moisten the sand and allow to sit for one day. Continue this process until the sand completely fills any gaps between the paving stones.